Blog What does La Baye mean? La Baye was a small trading post established on the Baie des Puants (Green Bay, WI) in 1634 by Jean Nicolet. Nicolas Perrot, who was sent by Father Claude-Jean Allouez who was a French explorer of North America, continued the work that Nicolet had started. In 1671, the Jesuits constructed a mission. Fort La Baye was constructed in 1717. The town of La Baye was incorporated in 1754. At the end of the Seven Years’ War, it went under British control in 1761 and was renamed Green Bay. By 1718, there were some Métis families in the very broad area of the fort, but no settlement focused on it specifically. Other families settled across the river from the fort in an area which was called Munnomonee, because of the Menominee native people that lived there. It was not until 1763 that concerted civilian settlement by people with some European ancestry began in the area. The first settlement in that year was led by Charles de Langlade, who was the son of a French-Canadian father and an Odawa mother. Most of the families had come to La Baye from the Mackinac area. In 1816 La Baye had a population of about 40 families, who were virtually all Métis. In the summer of 1820 La Baye was estimated by Henry Schoolcraft to have 500 inhabitants. Nicolet is noted for being the first European to cross Lake Michigan. In 1634 he became the first European to explore what would become Wisconsin. Jean Nicolet landed at Red Banks, near modern-day Green Bay, Wisconsin, in search of a passage to the Orient. He and other French explorers had learned from their native contacts that the people who lived along these shores were called Ho-Chunk, which the French translated as “People of the Sea”. In their language, it meant “harvest (cutting) the rice,” as they used wild rice as a staple of their diet. Nicolet concluded that the people must be from or near the Pacific Ocean, and would provide a direct contact with China. Nicolet became the French ambassador to the Ho-Chunk people. He wore brightly colored robes and carried two pistols, to convey his authority. The Ho-Chunk people appreciated his ritual display. 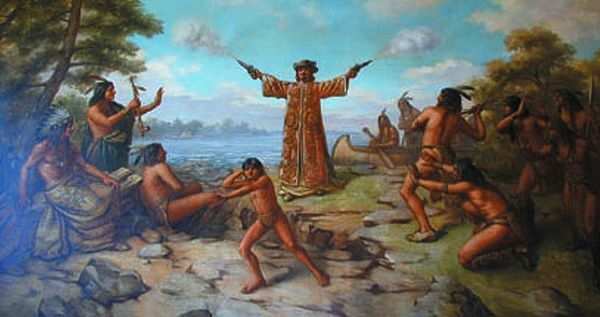 With some Ho-Chunk guides, Nicolet ascended the Fox River, portaged to the Wisconsin, and travelled down it until it began to widen. So sure was he that he was near the ocean, that he stopped and went back to Quebec to report his discovery of a passage to the “South Sea,” unaware that he had just missed finding the upper Mississippi River.